REDDING, CA--(Marketwired - Feb 11, 2014) - Many Americans choose to correct their vision with LASIK, reducing or even eliminating their dependence on corrective eyewear, says Dr. Michael Sumsion, a Board-Certified Ophthalmologist. As a courtesy, the Redding LASIK surgeon offers complimentary consultations at his practice, Riverside Eye Care, for anyone interested in the procedure. Dr. Sumsion stresses that the procedure might not be appropriate for all people, so determining candidacy through a consultation prior to surgery is important. "This is a big, life-changing decision for many people, so hopefully I can help make it a little easier on them." Dr. Sumsion also notes that he can recommend alternative solutions for anyone who does not qualify as a candidate for the procedure. In a recent blog post announcing free LASIK consultations, Dr. Sumsion says his practice offers a unique difference for LASIK candidates. With an innovative process called iLASIK, he says he is able to perform the procedure without the use of a surgical blade. The all-laser device was developed to maximize patient comfort, as well as provide results that are as precise and accurate as possible. Using iLASIK with Wavefront™ technology, Dr. Sumsion explains he is able to map out the patient's eye and create a 3D image, allowing him to create a personalized treatment plan for each of his patients. Once a treatment plan has been established, Dr. Sumsion says a corneal flap must be created in order for the cornea to be reshaped during the LASIK procedure. He notes that many other physicians use a blade for this process. According to Dr. Sumsion, a flap created with the blade-less IntraLase Method of iLASIK typically has less complications and greater stability than one created with a blade. In the final stage of LASIK, he says he uses a "cool" laser to reshape the patient's cornea according to their customized treatment plan and correct refractive errors such as nearsightedness, farsightedness, and astigmatism. According to Dr. Sumsion, a typical LASIK procedure takes approximately 25 minutes. Patients should not experience any pain during surgery due to anesthetic eyedrops administered prior to the procedure, but some patients may experience some discomfort after the procedure. He explains that ice packs, over-the-counter medications, or medicated eyedrops can help manage any soreness that may occur. Dr. Sumsion also notes that some patients may experience side effects during recovery, including blurry vision and sensitivity to light, but these conditions should subside quickly. Dr. Sumsion encourages anyone in the Redding and Red Bluff area considering LASIK to contact his office and schedule a complimentary LASIK consultation. "I look forward to helping our community learn more about the procedure and discover if it is right for them," he says. The practice also offers financing options through CareCredit® to help qualified applicants manage the cost of procedures. 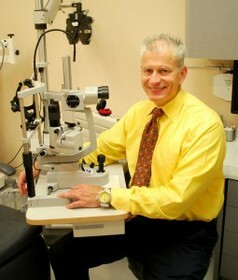 Dr. Michael Sumsion has been practicing as an ophthalmologist in Redding since 1990. He offers LASIK laser vision correction, cataract surgery, and treatment options for a wide variety of eye conditions. Dr. Sumsion is board-certified, and is a member of the American Academy of Ophthalmology, the American Medical Association, and many other medical organizations. Dr. Sumsion is available for interview upon request.